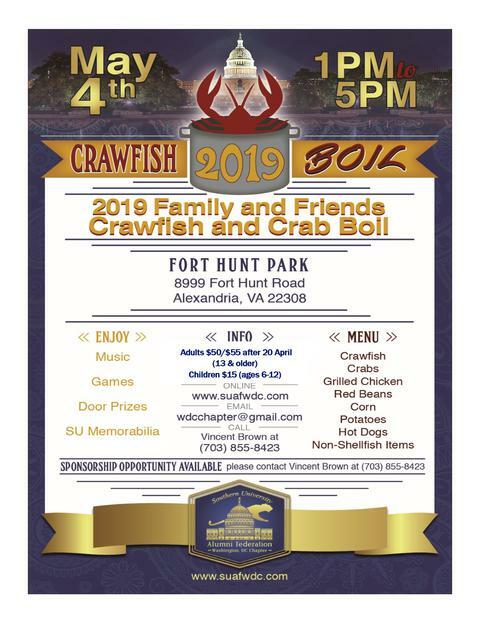 The 2019 Family and Friends Crawfish and Crab Boil is Saturday, 4 May 2019 at 1:00 PM at Fort Hunt Park, 8999 Fort Hunt Rd, Alexandria, VA 22308. Tickets are now available at $55 each for adults and $15 for children ages 6-12. The event is free for children under the age of six. For electronic payments, there will be a $2.50 handling fee for all tickets. There will be crawfish, crabs, red beans, grilled chicken, and more. There also will be music, games, and a whole lot of fun. Founded and incorporated The Summit Consulting Group, Incorporated (SCG), to support business development requirements of private sector companies, especially veteran-owned and service-disabled veteran-owned companies. Mr. Hensley serves as a Principal Consultant and Executive Strategist on business development and marketing to major companies seeking business opportunities with the Federal government. His clients include several major national companies based in northern Virginia; Washington, District of Columbia; and, Maryland. He is a service-connected disabled veteran. Mr. Hensley has over 40 years of experience in the Federal government. In August 2008, the Secretary of the Department of Veterans Affairs appointed Mr. Hensley as the Principal Deputy Assistant Secretary (PDAS) for Human Resources and Administration, Department of Veterans Affairs. In that capacity, Mr. Hensley was responsible for leading the management of the Department’s human resources programs and initiatives. He managed and executed a $300M budget in support of the Department’s investment in human capital, a major transformational initiative, involving over 10 contracts and approximately 35 private sector contractors. He directly supervised the Dean of VA Learning University and 6 Deputy Assistant Secretaries who managed the Department’s human resources policies and programs impacting some 310,000 employees, nation-wide. He also managed the provision of a myriad of administrative support services associated with the daily operations of the VA Corporate Office. Prior to this appointment, he served as the Deputy Assistant Secretary for Human Resources Management where he supervised 11 major human resources business lines; ranging from marketing, recruitment and staffing to employee benefits, human resources accountability, and workforce/succession planning. Prior to his SES appointment, Mr. Hensley served as the Director, Marketing, Recruitment and Veterans Employment Outreach Service, and principal advisor to the Deputy Assistant Secretary for Human Resources Management on policies and programs affecting the employment of veterans in VA and the Federal government. Mr. Hensley is the former Director, VA Center for Minority Veterans where he served as the advisor to the Secretary on programs and policies affecting approximately 4 million minority veterans. In this capacity, he provided technical guidance and assistance to over 300 VA employees who served as minority veterans program coordinators at local VA facilities around the country. He also helped veteran-owned companies access key officials to present their core capabilities and programs to benefit the Department’s mission. Prior to his VA appointment, Mr. Hensley was the Deputy Chief of Staff for Personnel with the U.S. Army Operational Test and Evaluation Command, where he directed personnel and administrative functions for 2,000 military and civilian employees. He was a 22-year active duty Army officer (now retired), rising to the rank of lieutenant colonel in September 1990. He began his military career as the chief of the separation transition facility at Fort Carson, Colorado. Other duty assignments included work with the Office of the Chairman, Joint Chiefs of Staff at the Pentagon, and the Office of the Adjutant General at the U.S. Total Army Personnel Command in Alexandria, Virginia. He has also served as the Commander of an adjutant general postal detachment in Korea and a personnel services company in Germany. Mr. Hensley's military awards include the Army Achievement Medal, the Army Commendation Medal (three awards), the Meritorious Service Medal (three awards), the Defense Meritorious Service Award and the Legion of Merit. Mr. Hensley was born in Shreveport, La., on August 3, 1950. He lived in northern Louisiana until he attended Southern University in Baton Rouge, La., where he earned a B.S. in social studies, with emphasis in history. Later, he earned a MA in education from the University of Northern Colorado in Greeley. He is a graduate of Leadership VA, VA's SES Candidate Development Program, and the Senior Executive Fellow Program, John F. Kennedy School of Government, Harvard University. He is a 2009 Presidential Rank Award recipient and has been awarded the VA Secretary’s Exceptional Service Award. Calvin Sims served in a variety of capacities in the military, private industry and in the community. His military career culminated in 1998 with over 20 years of service as a leader in Pentagon information technology (IT) acquisition and operations. In his last assignment, he served as Commander of the Single Agency Manager (SAM), chartered to centrally manage IT and communications facilities for the entire Pentagon. He was the architect of the initial Concept of Operations for the SAM, currently known as the Joint Service Provider. Other Pentagon leadership assignments included: overseeing the fielding, upgrading, budgeting and program defense efforts for major personnel and medical programs for the G-6 (formerly the Director of Information Systems for Command, Control, Communications and Computers (DISC4); principal architect of the Army’s Software Reuse Plan; and Executive Officer to the Vice G-6 (DISC4). While serving overseas in Zweibruecken, Germany, he managed all IT requirements on a 24x7 basis for both standard Army systems and US Army unique systems; implemented a metropolitan area network while merging the assets of three major commands; and prepared the Operational Concept Plan for the European Army Standard Information System (ASIMS). He later served as the focal point for planning, developing and operating all computing sites under the control of 5th Signal Command, managing both hardware and software. His military training includes completion of the Program Management Course, Defense Systems Management College, where he certified at the highest level; Command and General Staff College; Material Acquisition Management Course; and several other leadership and technical courses. Following his military career, Mr. Sims joined Advanced Resource Technologies, Inc. (ARTI) where he served in a variety of capacities including program manager, Deputy Director and Director. In his last role, as Vice President for Business Development, he helped define new products and programs; developed and implemented marketing campaigns; developed contract proposals, strategies and pricing; and oversaw customer service management. He further developed a comprehensive New Business Strategic Plan aimed at growing the business and created and monitored internal performance measures to help ensure progress toward goals. His next career move was to Lockheed Martin where he worked as a business developer for Information Systems and Global Solutions, a major business unit within LM, where he was instrumental in obtaining an acquisition valued at more than $400 million. He later served as a government relations executive in Washington Operations (corporate level) where he served as liaison between the government and LM for all Army IT and Command, Control and Communications. In this role as primary interface between LM and the Pentagon, he made valuable contributions to the company’s portfolio. Mr. Sims was a Distinguished Military Graduate of Southern University, where he earned a B.S. degree. He holds an M.S. from the University of Southern California. He is a life member of the Southern University Alumni Association, where he served as President and Vice President of the Washington DC Chapter. He is also a member of Omega Psi Phi Fraternity, Incorporated, Alpha Phi Omega National Service Fraternity, and several professional organizations. Mr. Sims retired in 2016 after a career spanning over 40 years. He and his wife Sanna reside in Burke, Virginia and have two daughters, Kristi Shervington, Esq, and Dr. Courtney Sims, MD. Kristi and her husband Kaleb have two daughters, Ayelet (4) and Hadassa (2). SUAF-WDC Chapter members and Human Jukebox alums brought to the chapter's attention the band's need for water during their game day performances. Due to the band's funding shortage, the band members do not always have drinking water after performances. The SUAF-WDC Chapter voted to fund water for the band for all home games during the 2016 football season. Generous donations from chapter members also aided in the small cost to fund this effort. The SUAF-WDC Chapter participated in various college fairs throughout the year. Several members of the SUAF Washington, D.C. Chapter volunteered at the various college fairs. The SU Human Juke Box, Dancing Dolls, the Out-Of-State tuition waiver for qualifying students and the engineering, nursing, and music programs are main discussion topics. Many students inquired about the waiver and lamented how that would tremendously help their financial situations. 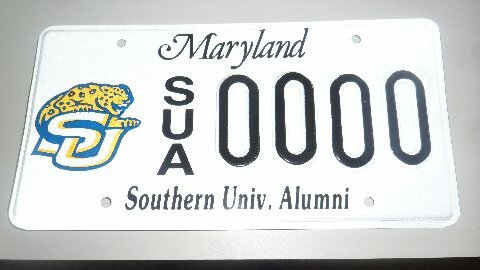 FINALLY....the first ever State of Maryland issued Southern University Alumni license tags are being made! We are excited to be included in promoting our illustrious Alma Mater as we drive around the beltway and in our respective communities. The chapter wishes to thank our inaugural 25 applicants for being instrumental in getting these tags made! It was a process that required great patience as the State of Maryland took a LONG time to approve and send us our sample plate (pictured below). So we offer a heart felt THANK YOU to our first 25! If you are reading this and you are a resident of Maryland and you are thinking "I want one! ", you can obtain replacement SU Alumni tags for your vehicle as well. Click here for more information on how to get your new license plates. We are excited to have our new official State of Maryland Southern University Alumni tags! Get yours today! It's that time of year! It's time to renew your membership for the 2015 - 2016 fiscal year. Please renew your dues TODAY! To pay your dues, you can mail your check to the chapter's Post Office box or you may pay online (processing fees apply to online payments). All the information you need to join our chapter or to renew your membership can be found here. If you have any questions about our membership options, please email us at wdcchapter@gmail.com. The SUAF-WDC Chapter had a great time on Friday, 15 March for SU & Friends Happy Hour at Sim's Creole Kitchen Pop Up at 1400 Irving Street NW #109. 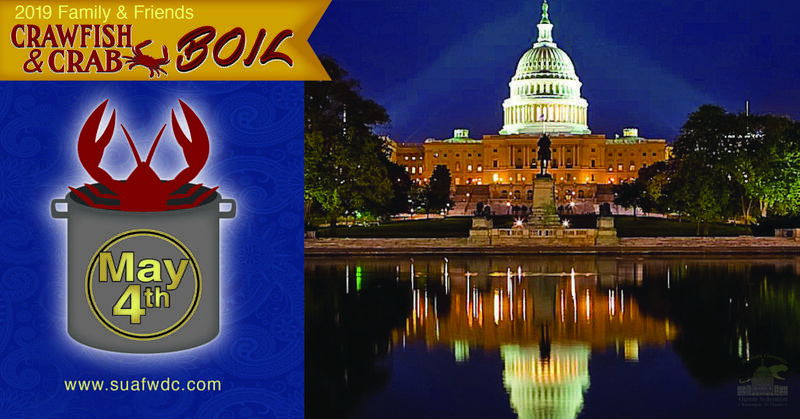 See you at the Crawfish and Crab Boil on Saturday, 4 May at Fort Hunt Park in Alexandria, VA. The 2019 Family and Friends Crawfish and Crab Boil is Saturday, 4 May at Fort Hunt Park. Elsie Scott received her Bachelor of Arts degree in political science from Southern University, her M.A. from the University of Iowa, and her Ph.D. from Atlanta University (now Clark Atlanta University). She presently serves as the Director of the Ronald W. Walters Leadership and Public Policy Center, Howard University. During most of her career she has been engaged in public service and higher education. Most notably, she has served as the President and CEO of the Congressional Black Caucus Foundation, as a Deputy Commissioner for the New York Police Department, Executive Director of the National Organization of Black Law Enforcement Executives (NOBLE) and in academic positions at several universities, including Rutgers University and North Carolina Central University. She is a 1994 recipient of a Presidential Citation from NAFEO for exemplary experiences that honor Southern University. Thank you Dr. Elsie Scott and Mr. Isaac Larry for your sponsorship of the 2018 Mardi Gras Ball and for your vote of confidence in the Washington, DC Chapter.